The Marquette After-school Adventures Program provides professional and nurturing care of the child during after- school hours. 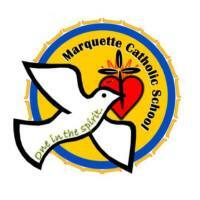 This program will provide an atmosphere in line with the philosophy of Marquette School to meet the emotional, social, intellectual, physical and development needs of the child. The staff of the program will consult parents and classroom teachers to best meet the individual needs of the child. The primary purpose of the Marquette After-school Adventures Program is to provide a safe and quality After-School environment for children in pre-school through 6th grade. Our program provides a healthy and stimulating environment to foster positive individual behavior, group relationships, autonomy, and healthy living for each child. The program operates Monday through Friday from 2:30 to 5:30 on scheduled school days. On scheduled early release days hours will begin at 1:30, instead of 2:30, which is in line with the school dismissal hours. If there are late starts due to weather during the school year, the program will still be in session. There will be no After-school Adventures Program when school is not in session, or when school is cancelled due to any reason, including weather.